Danney is all about experimentation, in life as well as in art. Being a renaissance soul, has allowed her to do many different things, including everything from pumping gas with a smile, to running a Scanning Electron Microscope on San Juan Island. She is not only artist, but also a writer, marine zoologist, Master Gardener, and an educator. Her often watery themes and her use of nature conjure up a sense of wonder and curiosity. Danney’s natural tendency is to play, and therefore mixed media allows her freedom, complexity, and joy of multiple techniques and textures. One day she might be pressing seaweed, and the next she could be playing with textiles. Adding collage to her list enables her to build scenes that wouldn't be possible in the real world, so she can offer up a scenario that is fantasy, humor, earth tragedy, or often, a little bit of all. 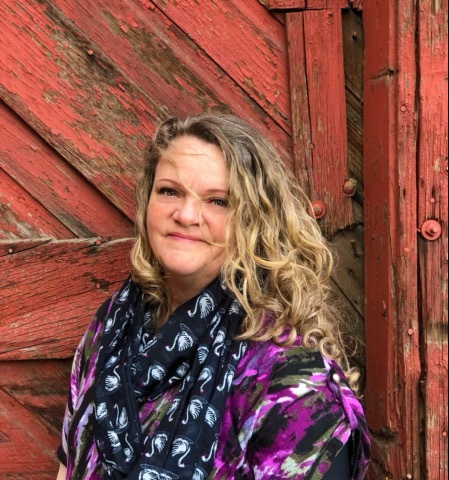 Involved in lots of different projects, Danney is pleased to be a Resident Artist at Gallery One in Ellensburg, and also an instructor for the Community School of the Arts at the gallery. Danney is also flattered to be part of a local women’s art collaborative, and they are currently working on a huge, funky arrangement of 81 multimedia, mini art quilts which will form “The Periodic Table of Badass Women!” As a writer, Danney is ecstatic to be working on a children’s book that features a young, female character that investigates animals and empowers them with magic, helping the animals solve environmental and conservation problems. Basically put, Danney likes to make stuff, and she makes it all happen in Ellensburg Washington, while still finding time for adventures with her family, her amazingly supportive husband, uber-talented teen-aged daughter, and a couple of real cute puppies.